Captain America fans: we have found what you need to show off your true fan status- an awesome Captain America waffle iron! If you love Captain America and you love waffles, then this waffle iron is a no brainer. Check out our video review or keep reading to see all the ins and outs of this Marvel Captain America Waffle Maker! The Captain America Waffle Maker is made by Marvel, the company who owns the rights to Captain America. While they may not typically be a kitchen appliance company, they seem to have done a great job on this waffle iron! So the waffle maker looks pretty cool right out of the box- an awesome shield design on top and waffle maker itself is nice and compact which is great for those with small kitchens (like me!). Running around $26 (check the current price here), the Captain America waffle maker makes one large waffle with a Belgian Waffle style grid on one side and a Captain America Shield on the other side. The waffle maker has a light on the top to indicate when the waffle maker has heated up but that is the only extra feature it has- we love a straight forward waffle maker though! Just like Captain America can fight crime all day, we can make waffles all day (and then eat them…)! So what happens when we make waffles with our Captain America Waffle iron? Let’s find out! After plugging in the waffle maker, the light on top light up to show that the waffle maker was heating. It took about 4 minutes for the light to turn off and the machine did feel hot! The owner’s manual recommended greasing the waffle iron plates (check out our blog on using the correct kind of grease on your waffle maker!) which means that this waffle maker does not have non-stick plates that so many waffle makers have these days. So grease away! There were no instructions on how much waffle batter to use in the Captain America Waffle Iron so I guessed and it took about 1 cup of our amazing waffle batter to fill the tray. That is a big waffle! I wasn’t too surprised though- just looking at how deep the grooves in the plate are shows that this is going to make a massive waffle (perfect since it only makes one at a time!). The waffle took about 4 minutes to cook and came out looking nice and golden brown (again, don’t count on the light on top of the waffle maker to tell you when the waffle is done- it is just to let you know when the machine is hot enough to pour in the batter!). There did appear to be some hot spots on the machine as some places on the waffle were more golden and crispy and other spots were a little pale. Both sides of the waffle looked great- the Captain America shield as well as the Belgian waffle side. I must say that I think having one side designed like a Belgian Waffle is an awesome feature. This made sure that the waffle was crispy because of the deep grooves. It didn’t leave the waffles ‘pancakey,’ as many themed waffle makers can be. Great job Marvel! Two sided waffle design- one awesome Captain America Shield and one standard Belgian Waffle. Cooked the waffles quickly and the waffles came out nice and crispy- not cakey at all. Makes one really big waffle so you really can be full after just one! A great price so you can get one for yourself and as a gift for all of the Captain America Fans in your life! The waffles cooked a little unevenly with darker brown spots in some places. Is the Captain America Waffle Iron Worth It? While I do not recommend throwing this waffle maker as Captain America throws his shield, I do recommend buying it and using it to make awesome Captain America Waffles. A cool design, a great price and some nice crispy waffles make this waffle maker a winner! And maybe you can throw the shield waffles in a food fight…. 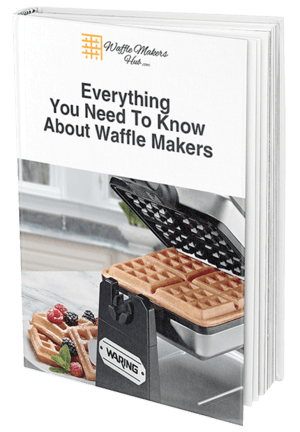 Check out our Ultimate Waffle Maker Buying Guide for other great waffle maker reviews!